Valmet has installed a new bio pilot plant in its research and development center in Sundsvall, Sweden. The equipment, called BioTrac, is a hydrolysis system which is used for process optimization and testing of raw materials based on biomass. This is part of Valmet's investment into developing new technologies for biorefinery applications, in order to deliver technology and process solutions to reduce CO2 emissions globally. Valmet's BioTrac is flexible both when it comes to different raw materials and process alternatives, and can be adapted to several downstream process steps. Hydrolysis is often the first step in a biorefinery, and a step that has to be passed, regardless of subsequent process chosen. Further refining of the biomass can for example be production of bioethanol, bio based chemicals and biomaterial, such as bio based plastics. "Many companies want to replace fossil fuels in favor of renewable raw materials. The product streams from our BioTrac system, and from the subsequent processes, can be used as bio based raw materials for production of for example plastics and chemicals. We are confident that our customers appreciate that they now can test their own ideas in our pilot plant, which in all essential parts correspond to the full scale equipment they are interested in," says Rickard Andersson, Vice President, Bio Technology and Environmental Systems, Valmet. "In the new BioTrac system it is easy to handle a variety of biomasses and we can closely control and follow what is happening in the process. 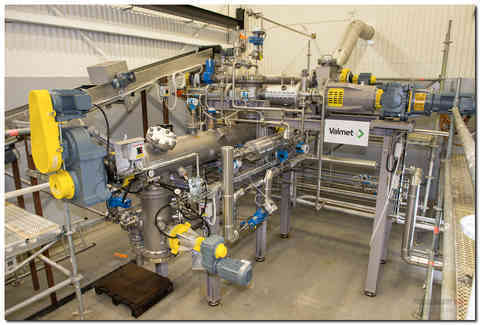 The system represents world class and is based on technology which was originally developed for the pulp and paper industry, where Valmet has extensive experience going over hundred years back," says Olof Melander, Manager, Valmet Fiber Technology Center in Sundsvall. Valmet's Fiber Technology Center in Sundsvall employs about 20 persons, among them a number of researchers. In addition to several different pilot plants, e.g. for washing, screening and refining, the technology center also houses a laboratory for bleaching trials and various chemical, pulp and paper analyses.